Jeff Bezos' $2 billion Day One Fund is an impressive move, but we need to see more heart, soul and innovation in his giving. At a public appearance in Berlin earlier this year, Amazon founder Jeff Bezos was asked about what he plans to do with his phenomenal wealth, a question that’s dogged him since before he became the richest man in the world with a net worth surpassing $160 billion. Practically in the same thought, he said he planned to do more charitable giving but also continue to dedicate huge sums to his pet project — space exploration, a venture he spends a staggering $1 billion a year to support. Bezos spoke of these two priorities as if they were equivalent, and in his mind, they were. His passion for space is geared toward saving civilization from the ills that plague planet Earth. My snarky alter ego went into overdrive: How is Bezos going to save humanity from itself when he can’t even save Seattle from Amazon? The men and women living in doorways and tents around my apartment building need stable roofs over their heads and a path toward sustainable lives, not spaceships. The same icky feeling came over me when I heard about Bezos’ planned $2 billion contribution to a new “Day One Fund” to help fight homelessness and create a network of Montessori-style schools in low-income communities. The announcement seemed impressive, in a way, but still modest for a man whose net worth in 2018 has risen by four times the average American’s annual salary every minute. I bit my tongue back then, but I’ve had a change of heart — mostly because I’m not satisfied that Bezos has shown us enough of his own. 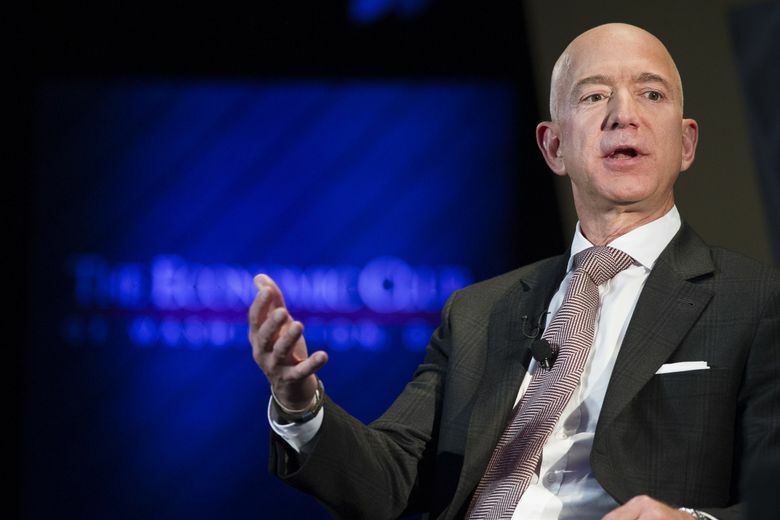 Bezos deserves credit for tapping into this region’s efforts to combat homelessness and improve education choices and outcomes, but on both fronts, he needs to think more globally and do far more locally. The homeless people in our region don’t exist in an economic vacuum, and contrary to what Bezos says in his Day One Twitter announcement, low-income children are not mere “customers” akin to users of Amazon’s myriad services. The area’s high cost of living, fueled in large part by the current tech boom, acts as an obstacle to self-sufficiency. Just try to find stable, affordable housing when you earn a poverty wage or less — or when you have kids. Try being a kid whose parents work multiple jobs just to make ends meet. Low-income communities need more than new schools for their children. The poor need new ways to generate wealth that they can pass on to them. Complaining about Amazon, and Bezos, isn’t a mere pastime for the disgruntled. What we are going through feels like an existential crisis. They deserve the scrutiny. Seattle has always been a company town. Both Boeing and Microsoft exerted a pull on the public’s imagination and economy that felt outsized at times. But Amazon’s influence — economic, political, social and I would argue spiritual — is on a whole other level. Its value system, questionable on several fronts, stems from the man who founded it. Dystopian accounts of Amazon distribution-center workers — walking miles per day inside massive warehouses and eschewing restroom breaks to keep up with the frenetic pace — are well-documented. It’s shameful that in many states where Amazon operates, the company is among the biggest employers of workers who receive food stamps. Amazon is as much a reflection of its boss as the Day One Fund is of its benefactor. I think Bezos should reflect more on what’s good about the community he and his company call home — and reflect more on the good he’s capable of doing. Seattle is smart, freethinking, disruptive and conscientious to a bleeding-heart degree. Those values, cultivated long before Bezos even thought about starting his online bookseller in 1994, help make Bezos a great businessman and Amazon a successful business. To whom so much is given, so much more is expected. Now is the time for Bezos to pay back with a depth of boldness, civic participation, accountability and, yes, money that may seem uncomfortable for a man whose presence is felt all over town but who has chosen to keep a low profile. Bezos has shown a desire to step up his game. I want him to speak as obsessively about using innovation to achieve economic justice in his own backyard, in the here and now, as he does about saving all of humanity in space, generations from now. For a man who lives life and leads his company as if they’re on a race against imminent demise, that’s not too much to ask. He needs to do more than step up. He needs to change the game.